In this science project for kids, the student will examine the nature of biological population growth, which typically follows a specific pattern. This begins with an initial "lag" phase where there is little increase in the number of individuals. After a fairly short lag phase, there is a rapid exponential growth phase that is typically short-lived. Most populations then reach a stable phase where if nutrients are available, the population with fluctuate at a steady level. 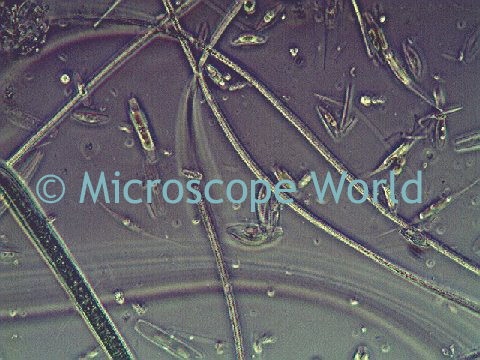 Bacteria captured with a digital biological microscope. For this lab exercise, typically the teacher grows cultures and takes images with a document camera or the students can grow their own cultures and capture images with the camera or with a student microscope. Wear safety goggles and gloves at all times. Prepare sterile Petri dish with proper agar or nutrient source according to instructions usually provided by bacterial provider using aseptic techniques. Sterilize the bacteriological loop, and then inoculate the agar with the bacteria or provide prepared agar to give the students in a Petri dish. Note the time on the bottom of the dish. Focus with the document camera on the Petri dish and capture an initial image. Place the cover on the Petri dish, but do not turn it upside down. Use the document camera and set for recording a time lapse sequence of pictures. Focus the camera, so the entire radius of the Petri dish is in view. Have the camera take a picture every 30 minutes. Stop recording after 48 hours. In each image of the growing bacteria, measure the diameter or approximate area of 3-5 colonies of bacteria on the plate. Average these for each time point. This measurement can be done with a metric ruler or with the calibration tool on the microscope or document viewer software. Record the average diameter or area of the bacterial colonies per time elapsed. Label the graph paper with time on the X axis and Colony size on the Y axis. Plot the average diameter of colonies in each frame on the time lapse sequence. With the recorded data, find an equation that describes the line or curve on the graph in the growth portion of the graph. Express the equation in both change in measurement (#s of bacteria) over change in time and also the natural log function. Does the plotted curve obtained match the predicted sigmoid curve of the normal growth model? What does the best fit curve look like? Does it provide new info about growth? Are the normal "lag", "log", and "stable" phases evident? What factors might cause all living things to basically follow this kind of growth curve, be they bacteria or elephants? Have students prepare a lab report including the data, images and video to give a presentation to the class.